This homemade tissue paper Valentine card is quite an easy craft to do; it uses the same folding and cutting paper craft technique commonly used to make paper snowflakes. 1. Prepare the card stock or construction paper base. The cards shown in this project are four inches square, made from a 4 inch by 8 inch rectangle, folded in half. 2. Cut a square of tissue paper just a little smaller than the front of your card. 3. Fold the square in half, then in half again, forming a smaller square. Now grasp the corner where the folds meet and fold it diagonally to meet the opposite corner, forming a triangle. 4. Use sharp, pointed scissors to cut out designs in the folded triangle, making sure each cut goes through all the layers. To form a heart-shaped design, cut out half of a heart shape against a fold. If desired, round off or cut curving lines along the top of the triangle to make the final opened shape a little less square. 5. Carefully open your design and flatten it out with your fingertips. 6. Apply a thin circle of white glue to the center of your card. Center the cut out design over the glue and press the middle section down very gently. Hold up one side of the design, apply a thin layer of glue beneath it and press down, working from the center outwards. Repeat until the design is glued down completely. 7. Allow your tissue paper card to dry. If the card stock bends a little out of shape as it dries, weigh it down under a heavy book for a while to straighten it out. — Experiment a little with the cut out designs; a little practice in snipping and cutting will help you improve the final version. 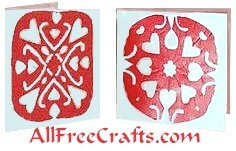 — Try a reverse design using red card stock and white tissue paper or other lightweight paper.